Happy New Year and welcome to the Q1 2010 edition of The Forum, Active's quarterly newsletter dedicated to event organisers like you. Our goal is to provide you with useful information and we hope you enjoy it. Rather than providing additional people access to your database, organisers can custom build whatever report they desire and apply a URL (or Smart Link) to this report that will update in real-time and allow event stakeholders to access the most up-to-date information at any time, with a simple click of the mouse. These reports can be kept private and password protected or they can be made public by placing the Smart Link on your event website. It's easy to use - log in to your Active RegOnline account and go to the Report Builder section. 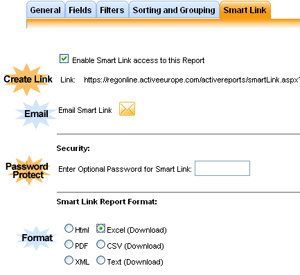 Click on Create a New Report and Smart Link will be the 5th tab in the report creation process! Contact us for more information about how to set up a Smart Link. The Triathlon Cycling Running Show on 13-14 February is the UK's top multisport exhibition - if you love to swim, bike and run, this is the place to be. Three seminar theaters, a SwimZone, 10K run and indoor cycling competitons are just some of the highlights attendees can expect at the show. The Active Village is a must-see section of the exhibition. As industry leaders for online registration systems and marketing services, our technology is geared for event organisers like you. Our products are built to help save time, increase revenue, manage participant data and expand event exposure. We will have our team of experts on site to answer questions and give experienced advice about managing triathlon and endurance events. But don't just take our word for it - visit with the 7 other event organisers in the Village who use our solutions: VoTwo, All About Triathlons, Liverpool Triathlon, Tri & Enter, Lakeside, Telemark Productions and Tatton Park Triathlon. If you can find some time between a coaching seminar and the sports clinic, swing by the Active Village to check it out. Click here for more information about the TCR Show, 13-14 February 2010. Active Network is proud to provide online registration for Live Earth. In partnership with corporations, non-governmental Organizations (NGOs), and entertainment and political influencers, Live Earth creates innovative, engaging events and media that challenge global leaders, local communities and every individual to actively participate in solving our planet's urgent environmental crises. On 07.07.07, Live Earth created unprecedented global awareness for the climate crisis, when it produced "Live Earth: the Concerts for a Climate in Crisis". The concerts were hosted on seven continents, broadcast in 132 countries, and inspired 2 billion people worldwide to engage with the issues and the solutions surrounding the global climate crisis. The Dow Live Earth Run for Water – to take place April 18, 2010 – will consist of a series of 6 km run/walks (the average distance many women and children walk every day to secure water) taking place over the course of 24 hours in countries around the world, featuring concerts and water education activities aimed at igniting a tipping point to help solve the water crisis. Jessica Biel, Alexandra Cousteau, Pete Wentz, Angelique Kidjo, Carl Lewis, Kara Goucher, and Jenny Fletcher will lend their names and their time in support of this important cause. Click here to find an event near you: www.liveearth.org/run. Don’t see an event in your city? You can create a “Friends of Live Earth” run/ walk in your community: Once you register an event, you'll receive a toolkit which will help you host a great event: event ideas, videos, "green" guidelines, planning checklists, and a way to invite your participants online. Find out more at http://liveearth.org/en/friends. We already have more than 50 countries represented – be part of a global run and help raise funds and awareness about the water crisis! Click here for press releases and more info.